BOOM GLIDE | Pro Chem, Inc.
BOOM GLIDE has been tested for compatibility with wear pads and seals on mobile cranes and meets the specifications for Grove Equipment WPG and EP-MPG. It is carefully formulated using high viscosity base oil and a proprietary thickener system fortified with Moly and special additives. This unique blend of lubricants provide this grease with outstanding extreme pressure properties, excellent water repellency, oxidation resistance and a wide operating temperature range. It is formulated with an innovative and synergistic combination of solid lubricants, which physically adhere to the metal surfaces to form a strong protective film, preventing welding and reduce friction even under the most severe operating conditions, such as very heavy shock loads. It contains no undesirable additives such as antimony, lead, chlorine or zinc. This grease is for virtually any multipurpose or severe extreme pressure application. 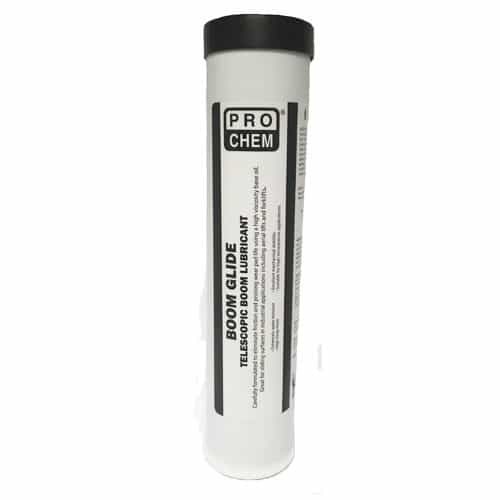 BOOM GLIDE meets and exceeds the demanding industrial testing requirements of ASTM D 4950, earning it the GC-LB classification by the National Lubricating Grease Institute. Scrape all old grease off. Apply using a paintbrush or roller.